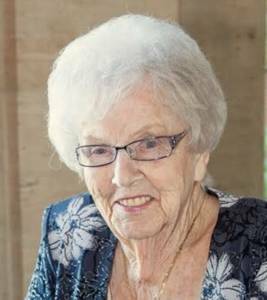 Jeanne K. Guyitt, age 93, passed away peacefully surrounded by family February 1, 2017. She is preceded in death by her husband Alan R. Beloved mother of Dennis A. (Kathryn), Candice J. (John) Cubba, Cynthia S. (Richard) Alden and Kevin T. (Gay Ann). Cherished grandmother of Shawn, Jerry, Mike, Kevin, Damon, Joseph, Andrew, Anne, Lisa, Christopher, Felicia, Joseph, Ann and Steve. Great grandmother of Kathryn, Allen, Josh, Jacob, Madisenne, Gabrielle, Liberty, Francesca, Lincoln, Nolan, Jack, Logan, James, Aaron, Olivia, Ryan, Ali, Kennedy, Keegan, Everett. Great great grandmother of Kimber Rose. A visitation will be held on Friday from 3-9pm at Leonard A. Turowski & Son Funeral Home, 9300 Middlebelt (btwn West Chicago and Joy Rd.) with a Scripture service at 7pm. A Funeral Mass will be on Saturday, 12:30pm at St. Valentine Catholic Church, 14841 Beech Daly Rd. The family asks that any memorial donations be made to St. Jude's.